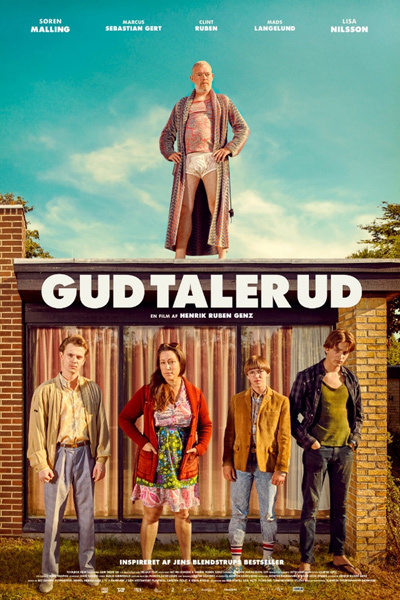 A film about an eccentric man of the world called God, who lives in an ordinary detached house with his family: his Swedish wife Gerd Lillian and his two youngest sons, Thomas and Jens. The oldest son, Mikkel wants nothing to do with God, so-called because he treats the world as his own creation. In reality, God is a man with a mild dependency on alcohol. Omniscient and inspirational, he rules his subjects with love, cunning and an iron rod (not to mention spirit). A rebellion is quietly looming in the shape of his sons and Gerd Lillian, but it comes to nothing when God is diagnosed with cancer and compassion replaces anger. However, when God is seemingly cured of his disease, his sons unite in their desire to kill God - if the cancer couldn't do it, they must. God survives, but the cancer returns - this time with a vengeance. Only when God realises that his final hour is upon him is he able to relinquish his kingdom and set his subjects free. In death, God takes on a human guise.